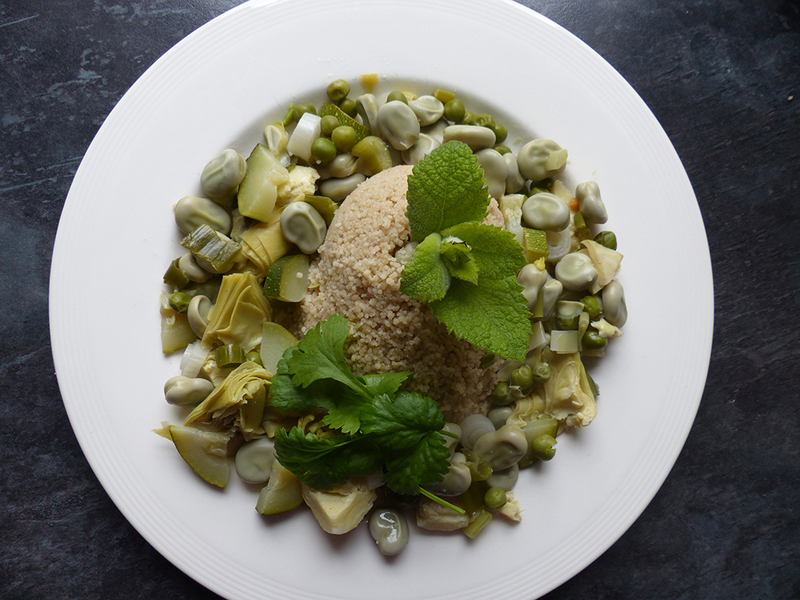 A summer dish with lots of fresh vegetables, herbs and couscous. Good dish to serve with a barbecue and a glass of cool white wine. First make the broth. Bring the stock to the boil and add all the vegetables. Cook for about 5-10 minutes until tender. Season to taste with salt, pepper and the fresh herbs. Use the broth to prepare the couscous. Put the couscous into a bowl and add enough broth to cover the couscous with about 1cm extra broth on top (the couscous will absorb the broth and swell). Leave to stand until all the broth is absorbed. Put the couscous onto deep plates and arrange the vegetables around the couscous. You can add a knob of butter if you like for extra flavour. Add a little bit of broth to make it moist and serve.